On Saturday, the five Englishmen who make up Kula Shaker played their smash hits in the early sunshine, and the main stage area was already jam packed. 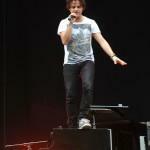 Later on Jamie Cullum, the pint-sized pianist, showed that he is a pure entertainer and showman. 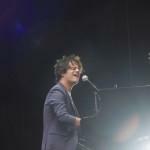 His jazzy songs and cover versions went down well, and he energetically bounded around the stage, jumping off his piano and even running through the crowd at one point. He even joked about only having one hit single, “played over four times on the radio!” and the audience loved it. As the heavens opened he sang a funny Singing in the Rain / Umbrella cover, paying homage to Gene Kelly and Rihanna. 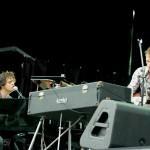 Cullum compared the Japanese festival with that of Glastonbury in England. “It’s brilliant here, even when it rains. 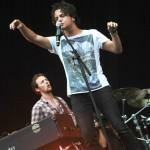 At Glastonbury it becomes like a sewer,” he said. Perhaps not the best image to bring to mind, and to some of the crowd the joke was clearly lost in translation. 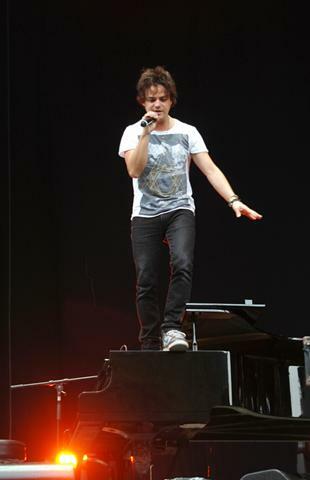 But when he tried speaking Japanese with a, “Watashi wa Jamie Cullum desu,” the audience appreciated the effort.